We’d love your help. 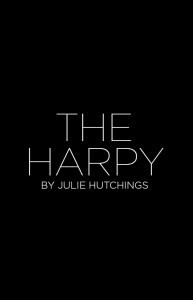 Let us know what’s wrong with this preview of The Harpy by Julie Hutchings. Published by REUTS Publications, LLC. To ask other readers questions about The Harpy, please sign up. This book is pretty dark, you should know that going in. It’s like the dark alley shortcut you shouldn’t take on the way home from the bar but know you’re going to anyway. If you have a trigger, this book will set it off. You know the part in the Twilight books (yeah, I read them, so what?) Anyway, remember when Bella so desperately wanted to be turned into a monster, but a nice one, who used her powers for good. The protagonist in this book is the opposite of that. She wants to be a monster too This book is pretty dark, you should know that going in. It’s like the dark alley shortcut you shouldn’t take on the way home from the bar but know you’re going to anyway. If you have a trigger, this book will set it off. You know the part in the Twilight books (yeah, I read them, so what?) Anyway, remember when Bella so desperately wanted to be turned into a monster, but a nice one, who used her powers for good. The protagonist in this book is the opposite of that. She wants to be a monster too . . . so she can exact vengeance on the dirt bags of the world. Mostly by ripping them apart and eating bits of them. In a way, it’s like being saved by a unicorn. No really, think about that. Imagine you’re in a filthy alley (hey, you chose to go this way), huddled against a dumpster. A monster (could be a troll, ogre, Jehovah's Witness, whatever you personally find terrifying) looms over you with a knotty club, a rusty knife, or a copy of the Watchtower. At the last possible moment before getting clubbed, stabbed, or proselytized to, a unicorn gallops in and saves you. How would that work? How would a unicorn, a creature clearly lacking opposable thumbs, save you? More than likely, the unicorn would ram its spiral horn through the monster’s chest, showering you with torrents of blood, chunks of pale pink lungs, and shattered bits of bleached white ribs. And the smell. Oh god, the smell. As if the dumpster you were huddled against didn’t smell bad enough. Now there’s a stench like rusted metal and rotten meat from the blood and innards, and that’s before the monster’s bowels let go. Yeah. That just happened. What then? Once the unicorn manages to shake the impaled monster off its horn (no thanks to you) by tossing its head vigorously and manically pawing with its forelegs, what do you do? While you ponder, the unicorn stares at you. It blinks the blood out of its eyes awaiting your decision. Sure, its back half is still a pristine white, but the front half looks like a cheerleader’s uniform in a slasher movie. Don’t ask the unicorn for advice, it can’t talk. This one’s on you, what choice will you make? If you think you’d avert your eyes and mumble your thankyous before scrambling out of the mouth of the alley to run the rest of the way home, the whole time swearing you’ll never spend another night chasing Jager bombs with shots of bottom shelf tequila, pausing only to be noisily sick on the sidewalk as you rest one hand against the rough exterior brick of a dentist’s office, then this book is not for you. But, if you’d climb aboard the unicorn and lean against the back of its head, letting the cooling blood soak into the front of your favorite t-shirt as you wrap your fingers in its gore-soaked mane before the two of you ride off into the darkness searching for others to save, then this is most definitely the book for you. The Harpy, by Julie Hutchings is dark. Characters deal with abuse, violence, and a touch of gore when they deserve it. Charity is a flawed protagonist, but who wouldn’t be with the same backstory? Always snarky, with brutally honest look at humanity’s underbelly, The Harpy is an excellent voyage into darkness. Characters are not who and what they claim to be, and everything’s fair game. If you like your stories dark, and your protagonists covered in blood, then this is the book for you. Julie Hutchings is a pizza hoarding, coffee swilling, beer guzzling, karate loving book geek with a love of all things creepy and obscure. She lives in America's Hometown of Plymouth, Massachusetts with her hilarious husband and two genius children.